Guilin Measuring & Cutting Tool Works is situated on the bank of the beautiful Li River in Guilin, China, where it produces the SHAN ™ brand precision metrology equipment. It's is the largest manufacturers of precision hand measuring instruments in China. The SHAN ™ brand product line of precision measuring instruments includes vernier calipers, dial calipers, digital calipers, micrometers, dial indicators, test indicators, depth gauges, height gauges, scale units and other special measuring tools. Annual production exceeds 500,000 products. SHAN ™ products have been widely recognized for their performance and value both at home and abroad. Our measuring instruments are widely used by other manufacturers of measuring tools to check their products. 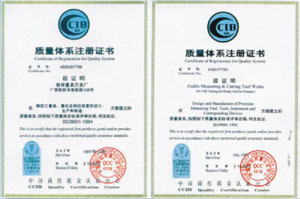 We achieved ISO9001 International Standard Certificate in 1997. Always striving to improve our products we continue to add to our capability. Recent manufacturing improvements include Laser Marking & Cutting Machines, New Pinion Hobbing Machines, Laser Interferometers and Gas Protecting Heat Treatment Furnace. No product is better than the raw materials that go into it, and at SHAN ™ all incoming raw materials are strictly controlled. Our people are what makes SHAN ™ products so special. We employ the best and most experienced engineers, technicians and workers to insure that SHAN ™ products are second to none. All of our employees takes great pride in their products. Each product is made by a master technician who insures that the product is of the highest quality. As an example, our caliper bodies are lapped by hand, and every product is carefully inspected and tested to insure that it will perform as promised..
Our promise: We will do our best to supply customers with satisfying products and services.